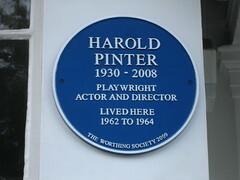 Harold Pinter CH CBE (/ˈpɪntər/; 10 October 1930 – 24 December 2008) was a Nobel Prize-winning English playwright, screenwriter, director and actor. One of the most influential modern British dramatists, his writing career spanned more than 50 years. His best-known plays include The Birthday Party (1957), The Homecoming (1964), and Betrayal (1978), each of which he adapted for the screen. His screenplay adaptations of others' works include The Servant (1963), The Go-Between (1971), The French Lieutenant's Woman (1981), The Trial (1993), and Sleuth (2007). He also directed or acted in radio, stage, television, and film productions of his own and others' works. Pinter was born and raised in Hackney, east London, and educated at Hackney Downs School. He was a sprinter and a keen cricket player, acting in school plays and writing poetry. He attended the Royal Academy of Dramatic Art but did not complete the course. He was fined for refusing National service as a conscientious objector. Subsequently, he continued training at the Central School of Speech and Drama and worked in repertory theatre in Ireland and England. In 1956 he married actress Vivien Merchant and had a son, Daniel, born in 1958. He left Merchant in 1975 and married author Lady Antonia Fraser in 1980. Pinter's career as a playwright began with a production of The Room in 1957. His second play, The Birthday Party, closed after eight performances, but was enthusiastically reviewed by critic Harold Hobson. His early works were described by critics as "comedy of menace". Later plays such as No Man's Land (1975) and Betrayal (1978) became known as "memory plays". He appeared as an actor in productions of his own work on radio and film. He also undertook a number of roles in works by other writers. He directed nearly 50 productions for stage, theatre and screen. Pinter received over 50 awards, prizes, and other honours, including the Nobel Prize in Literature in 2005 and the French Légion d'honneur in 2007. Despite frail health after being diagnosed with oesophageal cancer in December 2001, Pinter continued to act on stage and screen, last performing the title role of Samuel Beckett's one-act monologue Krapp's Last Tape, for the 50th anniversary season of the Royal Court Theatre, in October 2006. He died from liver cancer on 24 December 2008.